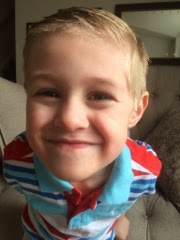 The Ways of the Wayments: Grayson is SIX! 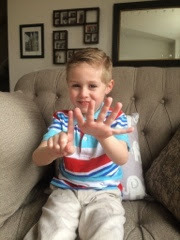 Grayson is SIX!! Why does that seem so much older than 5?! He's such a KID now. And such a HANDSOME kid at that! Treat: Nerds. And brownies. And cinnamon rolls. Toy: Skylanders and Legos and my teddy bear. What is something scary? Zombies, and birds pecking on my fingers. What do you want to be when you grow up? An explorer! What do you think about before you fall asleep? My favorite things I did that day. Grayson is the sweetest, funniest, smartest kid I know. He loves making up his own jokes, playing Go Fish, making his baby sister laugh, pretending he has his own YouTube channel, and (duh) playing Skylanders. He has a fantastic imagination, a great sense of humor, and an incredible memory. 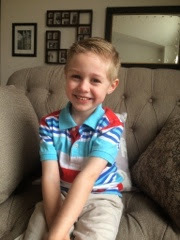 He's doing great in kindergarten, and he loves his teachers (who are WONDERFUL with him). We're working on getting him an IEP plan due to his Asperger's -- he needs some extra help with social skills. But he is excelling at academics. He is especially good at math, and is constantly surprising his teachers with how much he can do. He's getting really good at reading, and I love when he reads to me. He loves learning, and telling me what he learned about that day. He's made some friends, and has a few girls that follow him around (and he's totally oblivious to that fact!). He has grown by leaps and bounds at this school, and we are so grateful for it! The Montessori philosophy is perfect for him, and it has done wonders. Gray is such a good big brother, and does a great job watching out for his little brother and sister. He has a hard time getting along with Thatcher sometimes (he's three, whatcha gonna do), but most of the time they play nicely together. And Grayson loves, LOVES, Avy -- always giving her hugs and kisses, and entertaining her all the time. When he first sees her in the morning, he always yells "BABY!!" And runs to her. She calls him "buh-buh", which I'm guessing is "brother", and she loves him too. They have a special bond -- I love it. We love this little guy. He is such a special part of our family! He is so sweet and caring -- surprisingly sensitive to the feelings of others (some kids with Asperger's aren't at ALL). I love you so much, Gray! I'm so proud of the little man you are becoming! !